The City of Cleveland is applying for the Fiscal Year 2018 Edward Byrne Memorial Justice Assistance Grant (JAG): Local Solicitation. Emails may be sent to emergencyprep@city.cleveland.oh.us regarding comments and suggestions for this grant. Like the 37 police cadets of his class, Officer Ashondre Welch completed more than 1,000 hours of test-taking and training in the hope of becoming a Cleveland Police Officer. At the 141st Cleveland Police Academy Graduation, Welch took to the podium to share a powerful speech about the graduating class’ commitment to serve the city’s neighborhoods. 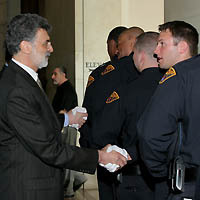 The United States Department of Justice and the City of Cleveland have entered into an agreement to create widespread reforms and changes within the Cleveland Division of Police. There will be broad data collection regarding many of CDP’s activities, including its use of force and stop and search practices, and public reporting of that data on this website. The City of Cleveland has announced the launch of a mass notification system that will provide critical emergency and non-emergency alerts to residents and visitors. The City encourages all residents, visitors, and businesses to sign up for the system known as CodeRED. Accidents and crime are never convenient, but now making police reports and accessing information can be done from work, home, or virtually any place that has Internet access. Anyone with information regarding the whereabouts of any of the missing persons listed in the above report is asked to contact the Cleveland Division of Police at 216.621.1234. All information contained in this report is public record and made available solely to aid the public. 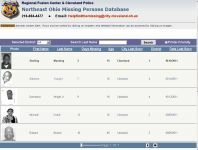 Information contained in this report reflects data in the Cleveland Police Records Management System at the time of report production. Because information can change quickly, and there may be gaps in data received, the City of Cleveland Division of Police makes no representation, either express or implied, that the information in this report is complete or accurate. Missing and Exploited Children - What Can You Do? 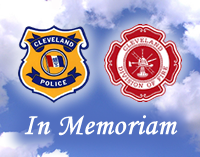 The Mission of the members of the Cleveland Division of Police is to enhance the quality of life, strengthen our neighborhoods and deliver superior services with professionalism, respect, integrity, dedication and excellence by working in partnership with our neighborhoods and community.